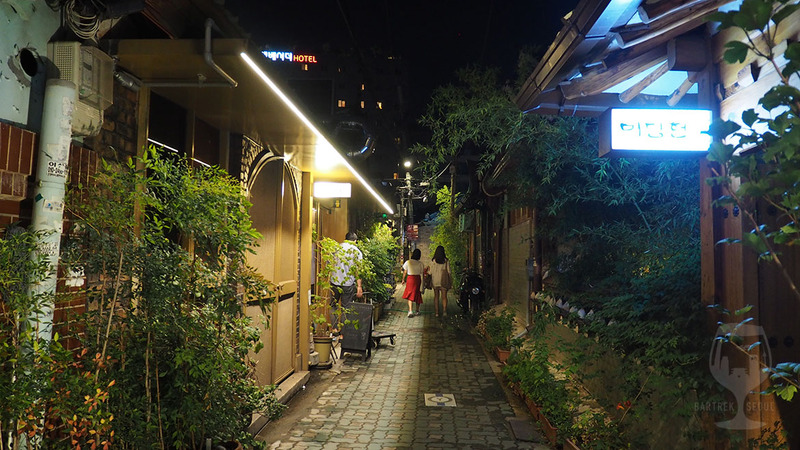 Ikseon-dong is like a box of chocolates, you never know what you’re gonna get! 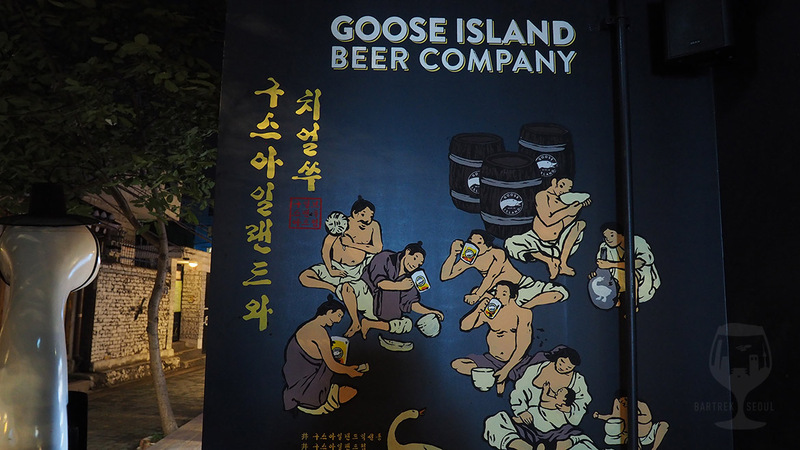 Stumble through the narrow streets and you’ll suddenly find the Goose Island Ikseon-dong Pub, with local and foreign beers, fowl on the menu, a huge goose statue and everything. Big goose at the entrance, with a seonbae hat! 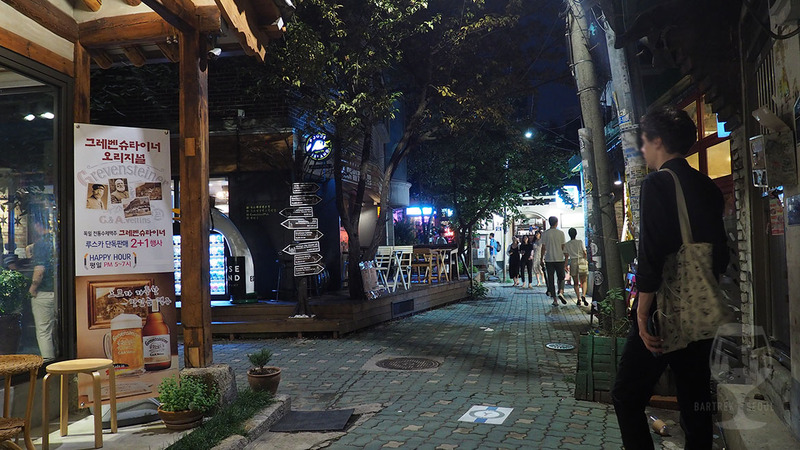 Ikseon-dong is a fantastic location, and meandering through the hanok maze is an often rewarding endeavour. 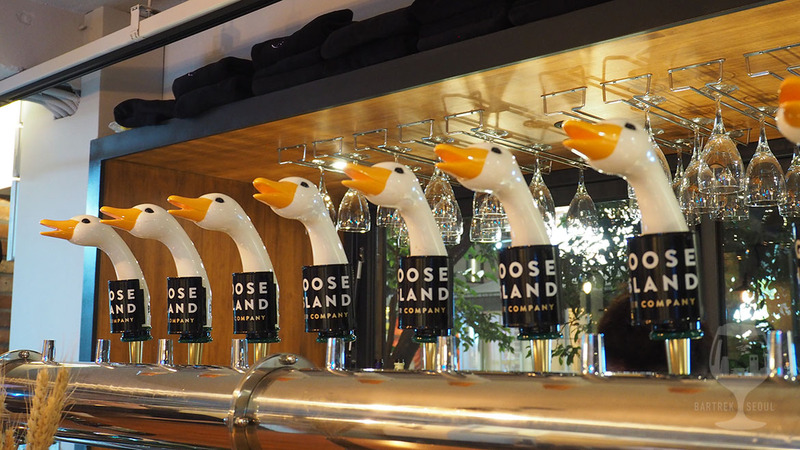 We’ve heard about Goose Island making an entrance into the Asian craft beer scene, but were surprised to see they put up a venue in such an uncharted, although booming, area. 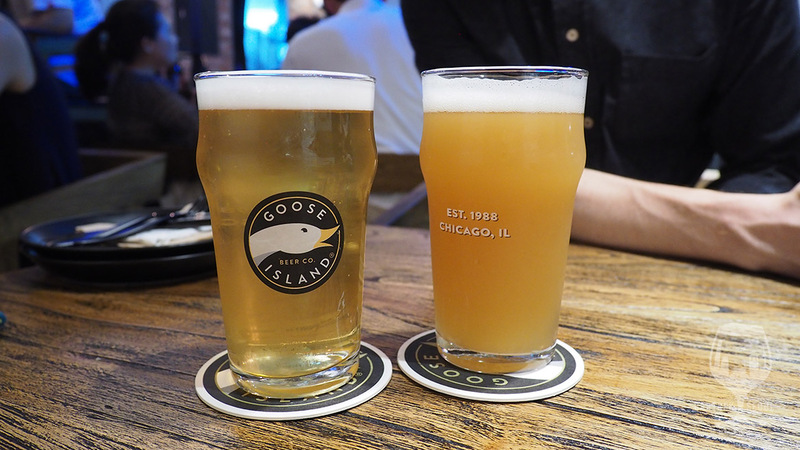 Goose Island’s signature line of 312 Urban Wheat Ale, the Goose IPA and the Sofie Saison have been common finds in bars and stores around Seoul for the last few years, of course including other Goose Island venues. 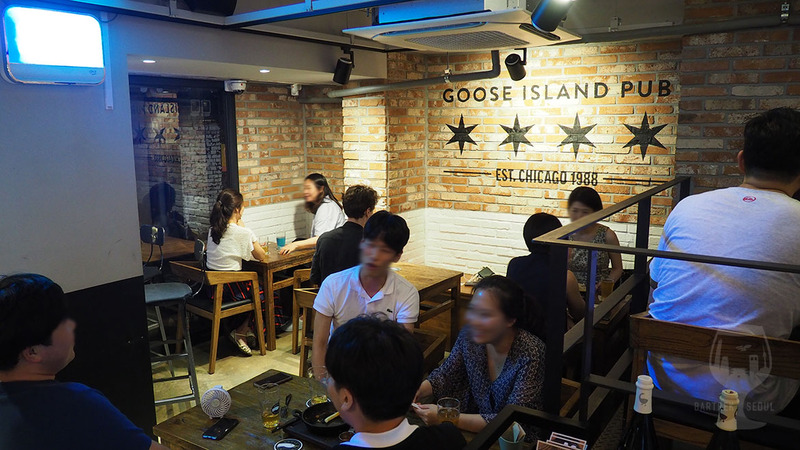 However, Goose Island is now also brewing beers in Korea, and are proudly offering a line of locally brewed beers, as well as their known classics and some special bottles. 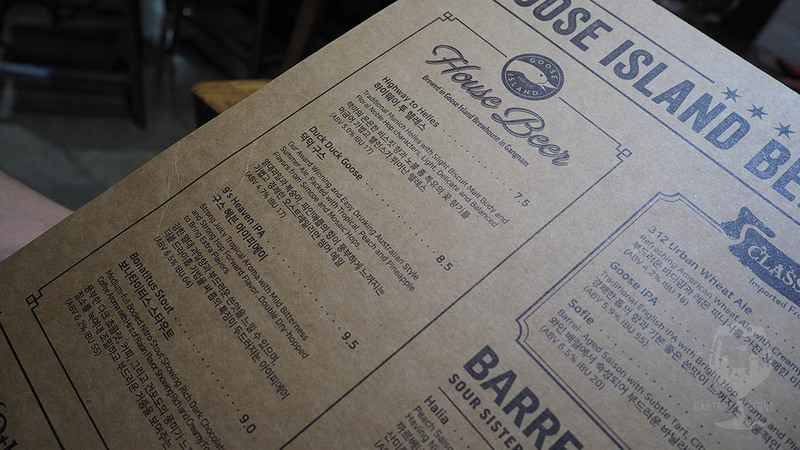 They also have a nice looking food menu, which we also dug into while tasting a couple of their beers. 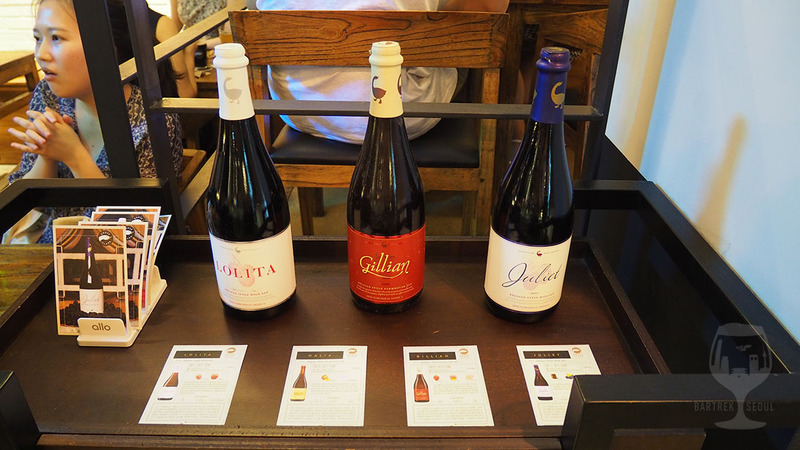 “House beers”, classics and special bottles on the menu. 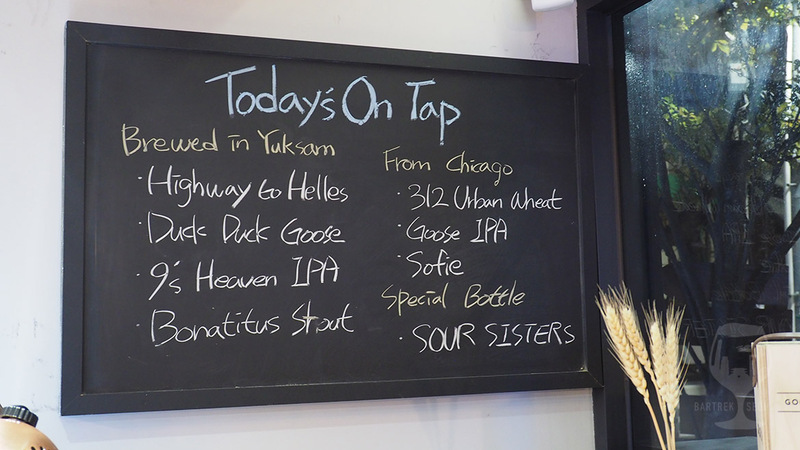 Tap list on our day of visit. We start of with the Duck Duck Goose, described as an easy drinking Australian style summer ale. It certainly is easy drinking, a very tender mouthfeel and soft carbonation, borderline daft, but with clear tropical flavors. Hopped with simcoe and mosaic, it has the peachy sweetness and pineapply bitterness that makes it fit the description. Pours clear and light with creamy foam. On to the 9’s IPA, which packs a bit more punch than the DDG, but still clocks in on the milder side of IPAs. A hazy, juicy double dry-hopped IPA with that same kind of tropical fruit bonanza. I didn’t know geese lived on tropical islands? 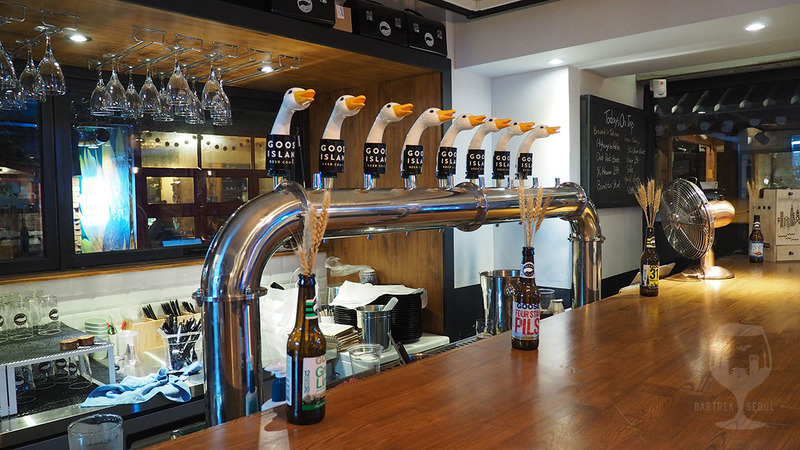 We know the classic Goose line-up well, so we only stopped here for two beers and some food this time, but we were pleased with the domestic brews and would be happy to check back and see what else is brewing later. Light and clear summer ale and hazy IPA. Bar food, snacks and salads. 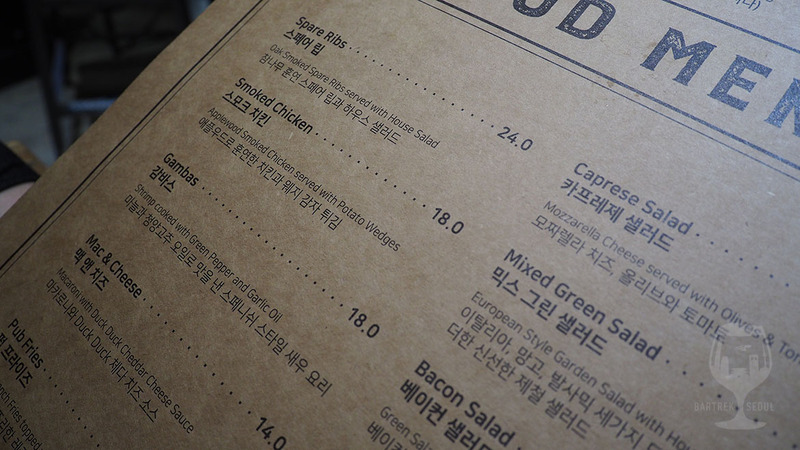 The food menu covers a selection of classic, and less classic, bar food, like chicken, fries and shareable salads, but no geese. 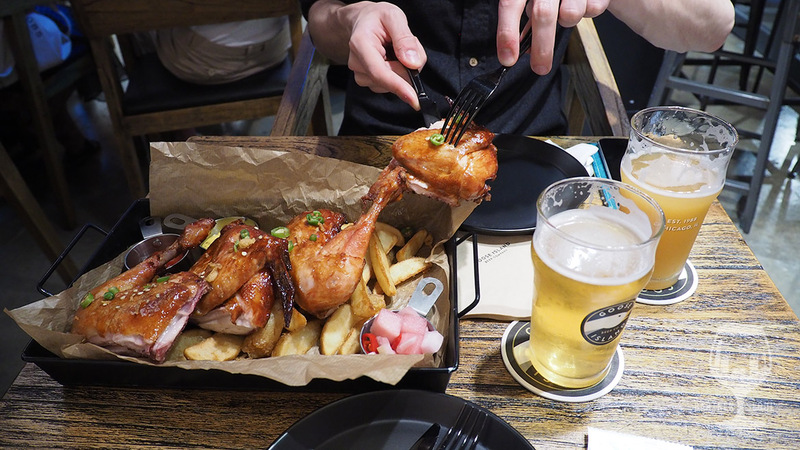 We went for the smoked chicken, which came served in a very instagrammable tray, the four grilled legs presented nicely on top of a lot of wedge fries. Looks aside, the chicken is tender and tasty, the skin nicely crispy and the applewood smokiness is just right. Sprinkled with onion, chili and served with two different sauces, it was a tasty and shareable meal. The wedge fries were also well cooked, not mushy or cold, and properly not overly salted. 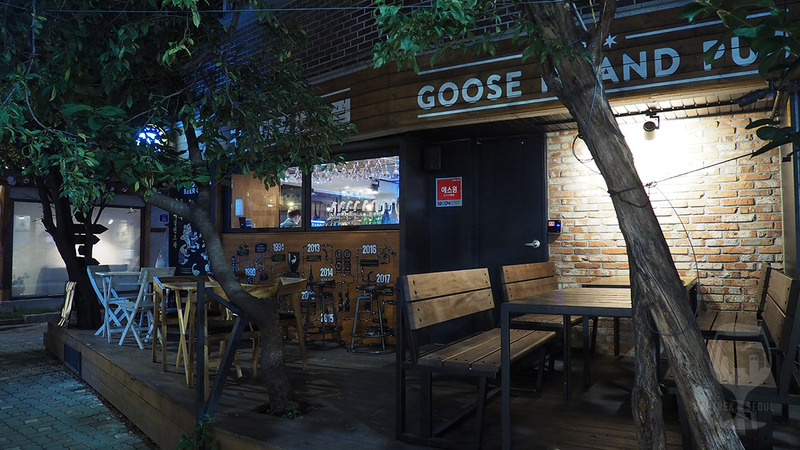 Just like Ikseon-dong itself, the Goose Island venue has an interior style that mixes old and new, industrial and crafty, very much in line with a standard Korean craft beer pub. 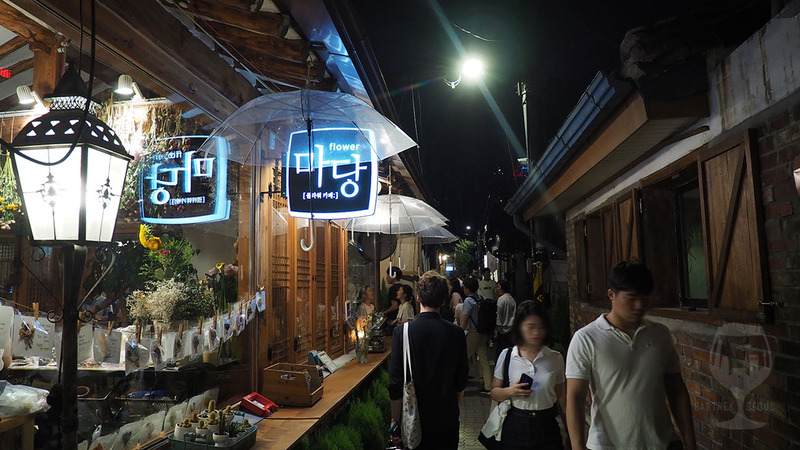 Rustic table tops with iron legs, brick walls with stenciled branding, a few traditional hanok details here and there, a large wooden bar counter with malts in empty bottles. Pop music plays at ok volume, and the seating is diverse enough to fit both small and larger groups without bothering each other. 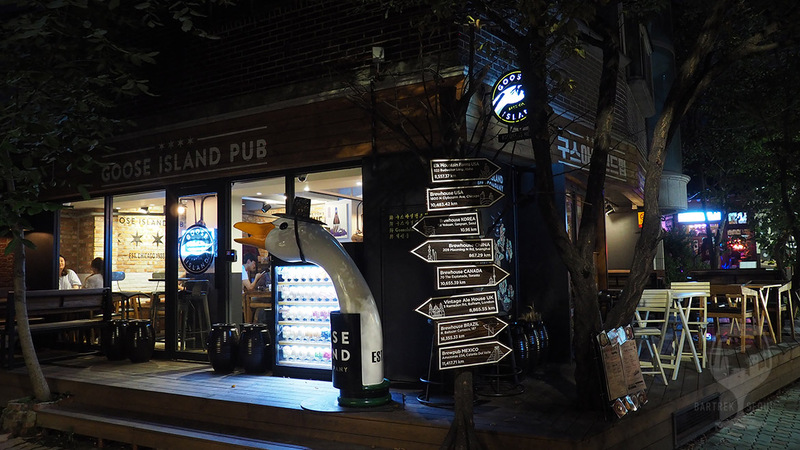 With both known classics and locally made specialties, Goose Island Ikseon-dong may be a good stop if you are exploring the area. Large counter with taps and decorative grains. 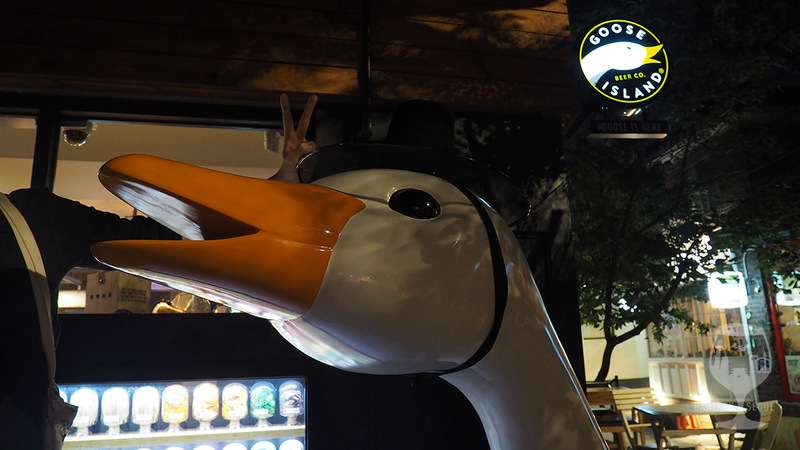 The goose is wearing a classic Korean scholar’s hat. Outdoor seating for the brave. The location is quite good!